- New factory-direct sales model allows for a direct link between customer and factory to ensure strong relationships and access to the people who are building the boats. Grand Banks Yachts Limited - the company that pioneered the Downeast-styled cruiser – after its strong re-entry into European market thanks to the new “direct sales model” and the Eastbay 44 debut during last Boot Dusseldorf 2018 – releases details and latest news from the yard for this first quarter 2018. Following the acquisition of Australian luxury yacht builder Palm Beach Motor Yachts in 2014, Grand Banks appointed founder of Palm Beach, Mark Richards as CEO of the greater Grand Banks Yachts group. With Mark at the helm, Grand Banks received multiple benefits from vision, build process, and structure, due to Mark’s hands-on approach and deep knowledge of both open ocean sailboat racing, and boat building experience. With the recreational motoryacht market becoming saturated in recent years, the group, lead by Mark, felt it necessary to return to first principles and re-evaluate the design and build processes of their products to remain at the forefront of the industry. Well known for popularizing the recreational trawler and introducing the world to the the Downeast express cruiser through the Eastbay brand, Grand Banks was looking to once again revolutionize the recreational marine industry. 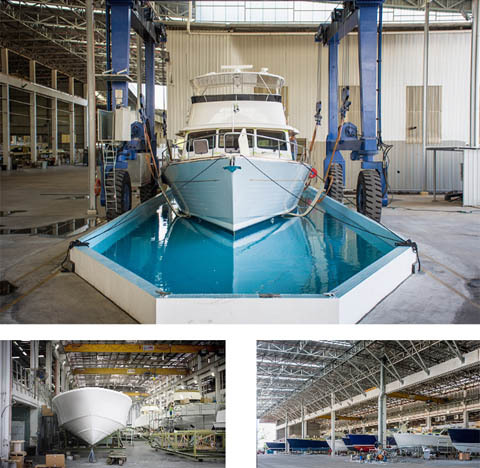 “We made the extremely difficult and unprecedented decision to stop making all of our current models while the factory underwent a complete overhaul to bring the main facility up to and beyond modern standards” – this is what refers Mark Richards - CEO of the greater Grand Banks Yachts group. To coincide with the company’s 60th anniversary, Grand Banks designed the revolutionary Grand Banks 60, which features a brand new hull form for the company, with a strong focus on performance and efficiency while still retaining the “Grand Banks soul”. Simultaneously the company designed and released a new contemporary addition to their Eastbay line, the Eastbay 44, to continue to cater to the market which they created. The new EB44 has been well received, with 15 hulls in production within the first 18 months. The factory overhaul also saw implementation of a completely new management structure that has maintained Grand Banks tacit knowledge while also employing several new key members across multiple divisions in the company. A fresh management team has reinvigorated the company’s drive and passion, while the new factory-direct sales model has also allowed for a direct link between customer and factory to ensure strong relationships and access to the people who are building the boats. For the European market, Grand Banks Yachts has appointed Colin Watts as our lead factory representative based in the United Kingdom, with both Gert van Barneveld and Albert Gerritsma based in The Netherlands, and Henrik Petersen in Denmark. 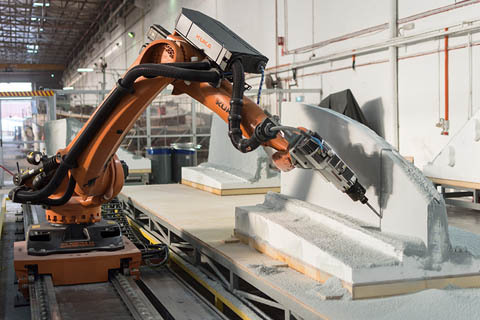 The factory and production process has benefited from new technologies ranging from multi-axis robotic CNC milling, a dedicated infusion shed that uses the latest in carbon fiber and infused vinyl-ester epoxies, and a streamlined production process. The addition of an on-premise covered testing and commissioning pool has further streamlined the build and testing process, letting all vessels be thoroughly tested in the factory before any open-water commissioning takes place. The company’s main facility is now a state of the art shipyard, that is one of the cleanest in the world, reducing its carbon footprint by designing around natural ventilation for improved airflow, and moving to efficient LED lighting throughout the factory. The scalability of the operation has been dramatically improved to ensure the ability to cope with the rapidly expanding product line that is scheduled to be released over the next 36 months.